Photo by Marvin Breckinridge. Published in Wide Neighborhoods: A Story of the Frontier Nursing Service, by Mary Breckinridge. Lexington KY: The University Press of Kentucky, 1981. Original edition 1952. “Where do babies come from?” Children have been asking this question for as long as humankind has populated the Earth, and parents have offered many answers: I found her in a cabbage patch, God sent him, the stork dropped by. For many decades, the most likely answer given by mothers and fathers in the Appalachian hills of Leslie County, Kentucky was…the ladies from the Frontier Nursing Service. 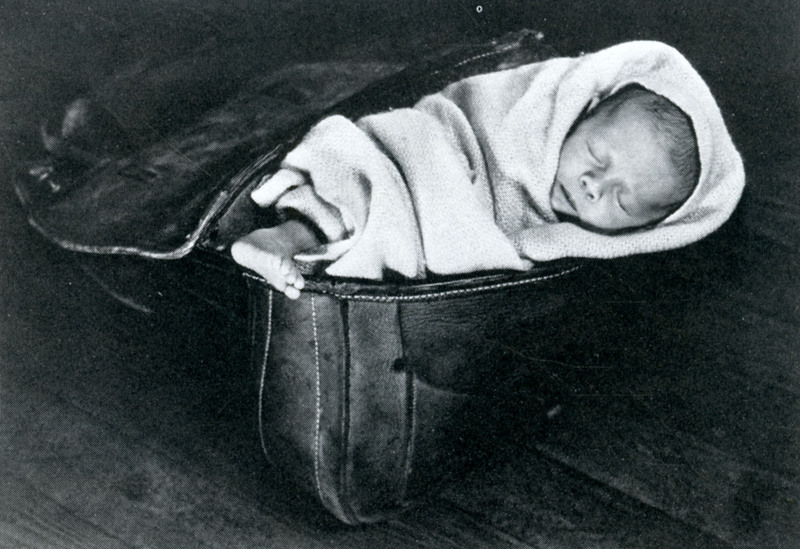 The proof is in the picture, a swaddled newborn tucked in a saddlebag. The (FNS) was more than just a cute reply to inquisitive children. Launched in 1925 in Leslie County, the service delivered thousands of babies over many decades in remote hill country where people were poor and doctors were scarce. By the 1980s, the number of births in Leslie County had dropped significantly, but show that 95 percent of the 20,000 births since the 1920s had taken place without a doctor in attendance, with an infant mortality rate consistently below state and national averages. Fourteen years after FNS began its work, its founder, Mary Breckenridge, started the Frontier Graduate School of Midwifery, sending its graduates all over the country to assist underserved communities. The graduate school evolved into Frontier Nursing University, still operating in Kentucky today. Mary was born in 1881, in Memphis, Tennessee, to a wealthy family of statesmen—including members of Congress, ambassadors, and a U.S. vice-president, her grandfather John C. Breckinridge. She also suffered great loss, including the deaths of a husband and two children. These experiences, combined with an interest in infant care and a thirst for adventure, led her to service in France post-World War I, then midwifery training in England, and eventually back to Appalachia to serve the communities there. She gave back as much as she was given. In 1923, Mary undertook, on horseback, an information-gathering trip to assess the availability and skills of midwives in three Kentucky counties (Leslie, Knott, and Owsley), and to determine what they and the childbearing women they served most needed. NLM holds Mrs. Breckinridge’s original manuscript, Midwifery in the Kentucky Mountains: An Investigation, and it makes for remarkable reading. Included in the manuscript is a data table listing the age, birthplace, literacy status, number of years in practice, cleanliness, and number of children reared for each practicing midwife in the region to whom Mary was able to speak. How did I myself learn about the FNS? I was lucky enough to work with a primary source, the film The Forgotten Frontier. Interning at the National Library of Medicine during summer 2018, I was tasked with determining the copyright status of films that had been most frequently requested by library patrons over the last two decades. I watched part of each film to see if it had a copyright symbol and did further research to determine whether or not the title was in the public domain. The Forgotten Frontier made my list, and once I began watching it, I did not stop until I’d seen the entire picture. I started my research after the final scene rolled, trying to learn the story behind the film and its galloping, seemingly fearless nurses. The Forgotten Frontier was conceived when Mrs. Breckinridge was searching for a new way to promote the FNS and decided a motion picture was the modern answer. The film was written, produced, and directed by Mary “Marvin” Breckinridge, Mrs. Breckinridge’s young cousin who was studying cinematography at the time. Marvin adopted a traditionally male name to ease into the male-dominated journalism profession and was known as a world-class photographer, cinematographer, and journalist during the 1930s. She did everything for the movie—managed the natural “sets,” filmed on foot and on horseback, organized the people in the scenes, and edited the film. The only assistance she had was a courier who helped to carry her equipment. The people in the film are actual FNS nurses and their patients, and most of them acted in scenes that told their own stories. In a 1984 documentary, Frontier Nursing, Marvin was interviewed about the making of The Forgotten Frontier and said that the people needed little direction and were all very natural; they had never seen a motion picture before and therefore did not imitate actors. Photo by Marvin Breckinridge, 1937. Published in Wide Neighborhoods: A Story of the Frontier Nursing Service, by Mary Breckinridge. Lexington KY: The University Press of Kentucky, 1981. Original edition 1952. The Forgotten Frontier shows the work of the nurses and the living conditions and needs of the Kentucky mountain people. 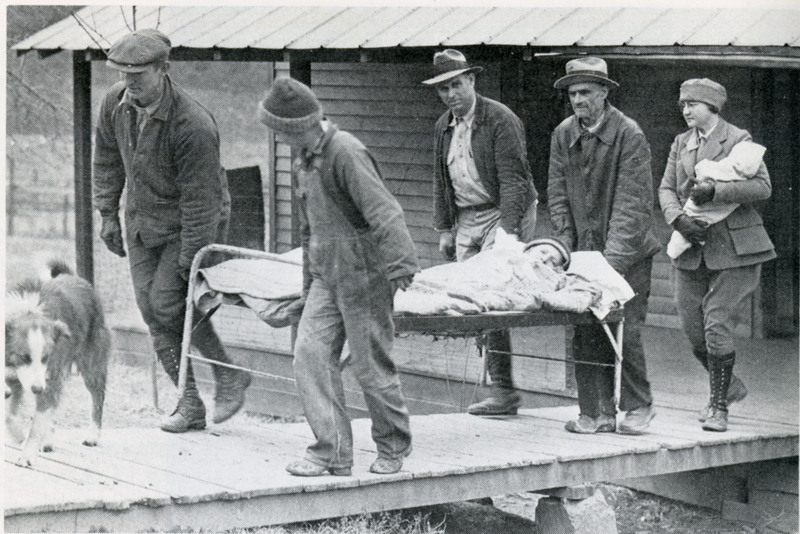 There are scenes of a nurse racing to a mother in labor and of men and a nurse carrying an injured man for 16 miles on a makeshift stretcher fashioned from wood that was chopped on the scene and lined with men’s jackets. All of the scenes in the movie are true stories, and my favorite is the inoculation of the schoolchildren. Two nurses arrive at the schoolhouse to give the children vaccinations against diseases common in Leslie County. All the children are gathered outside, ready for the nurses to do their work, when a teacher appears. As bold as brass, she says to her students, “You don’t want to be inoculated, do you, children? IT HURTS!” The camera cuts to the children, who have all gone rather still, and they all begin to shake their heads and say “No-o-o.” The nurses cajole them, and finally a little boy is brave enough to declare, “I’ll be second if somebody else will be first.” Following that bold statement, a father, who was standing with the parents behind the children, came forward and said he would be the first. After the parent and the little boy accepted their shots, the rest of the children fell in line and everyone was inoculated…except the teacher. The extraordinary abilities of the nurses were shown throughout the film. 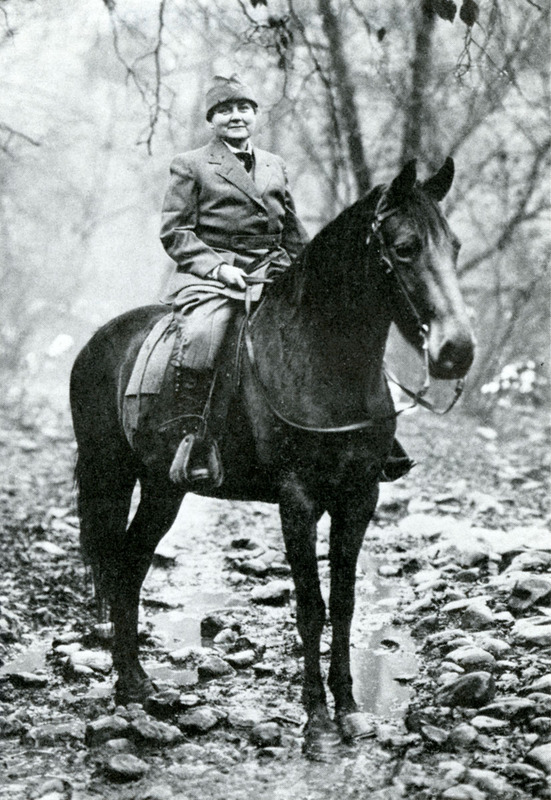 The women had to ride in rough, mountainous terrain during all kinds of weather. They had to ford rivers—horses swimming through water up to their necks. They rode at night with torches by their sides, the only way to light the path to a family in need. The Forgotten Frontier shows it all, and the dedication of the Frontier Nursing Service to its work and patients is evident throughout the reels. The stirring story of their service made it to the big screen, premiering in New York City in 1931. The film would go on to play for the rest of the decade until 1939, when it was last shown in a private viewing. The Forgotten Frontier is a wonderful, moving piece of cinema that demonstrates the care and skill the FNS offered to the people of Kentucky. These fortunate people had one person to thank above all for this beloved service, and her name was Mrs. Mary Breckinridge. Emma Carter is a junior at Millsaps College in Jackson, Mississippi. She is a history major and museum studies minor. 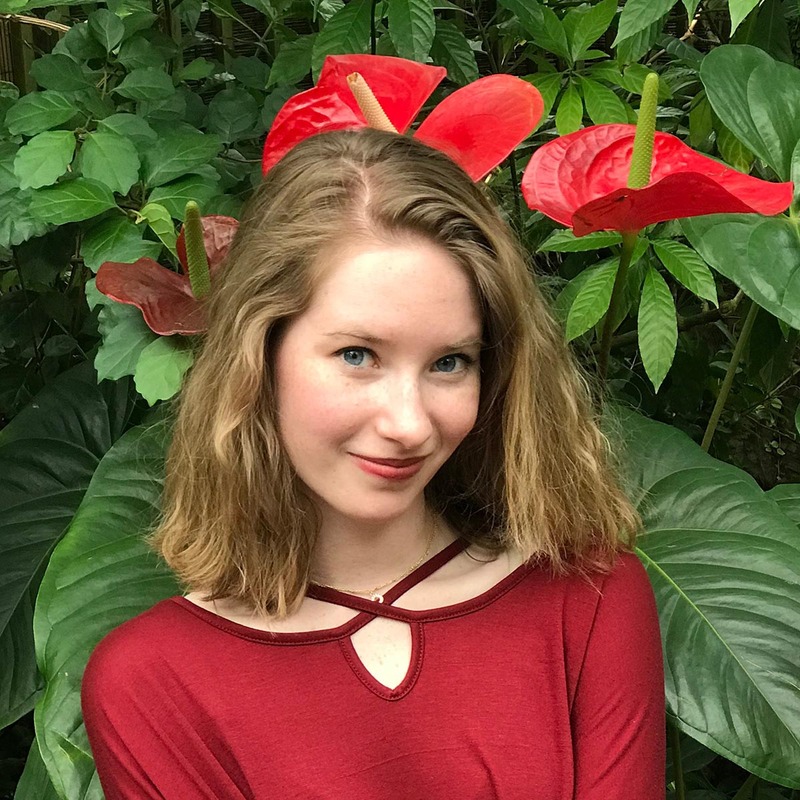 She interned in the Historical Audiovisuals program during summer 2018. Great story. One comment on this otherwise interesting and well written post- the use of the word deliver. Moms deliver their babies, it is their bodies doing the work. Midwives and other healthcare professionals attend and/or assist the birth. Think this article does a great job emphasizing the great safety record of these midwives! Thanks for this insight. So glad you’re reading! Alright, as you read my comment, you will realize that as I keep on, passionately, writing and I fall into my Appalachian Mountain ‘raisin’ I always enjoy coming across these documentaries, viewing and sharing them on social media and with residents of my tiny town. As well, I also talk to and with anyone in these parts who will listen to me about rural women’s health and nurse-midwifery. I am so like those original nurse-midwives, as I’m a Certified Nurse-Midwife with a homebirth practice in rural Appalachia of Northeast TN/Southwest VA, and Southeast KY, and I’m also from Appalachian Mountain stock 😉 AND I have ridden on horseback to attend a birth! While I typically drive my OLD 4 wheel drive Subaru to the births…over the years, I have traveled to homes in a snowmobile, a dump truck with a snowplow attached to the front end, on horseback, and on foot through 4 ft high snowdrifts. I can only hope for a trip in a canoe or helicopter to arrive, safely, to a birth…one of these days. Sadly, I have found that numerous younger adult residents of Southeast KY have never heard of the Frontier Nurse-Midwives or know the history of the Mary Brekenridge Hospital in Hyden, KY (which also recently stopped providing OB care). I so Hope, wish and am, constantly, researching available funds so I can provide healthcare, including free screenings to these women. But alas and alack, I am getting nowhere except further in personal debt. I love (hint am still addicted to midwifery) being a midwife; however, I grow disheartened that I’ll ever or that any rural serving Certified Nurse-Midwife will ever receive any true financial assistance And, therefore be Mightily beneficial to these women and babies. I keep reminding myself that my Reward is Elsewhere…Thank you, Lord.